The 30 seconds all-in-one device jailbreaking tool by @geohot has now been released for Mac OS X. Last week, blackra1n for Windows was released which was the first tool for jailbreaking iPhone (2G, 3G and 3GS) and iPod touch (1G, 2G and 3G) running on the latest iPhone firmware 3.1.2. Jailbreaking instructions for blackra1n on OS X are exactly similar to the one on Windows. Simply download blackra1n for Mac OS X (download link given below) and then follow the step-by-step guide posted here. I will highly recommend using PwnageTool 3.1.4 from Dev-Team if you want to preserve your unlock on iPhone. blackra1n is only recommended for those who are on the official supported carriers like AT&T and do not care about unlocking, or the one’s with iPod touches. UPDATE 1: Follow the step-by-step guide posted here to fix missing carrier name or logo on your unlocked and jailbroken iPhone 3G/3GS running firmware 3.1.2. UPDATE 2: You may also like to check out How to: Patch MobileInstallation File on iPhone 3.1.2 Firmware. UPDATE 3: Follow the step-by-step guide posted here to Enable Tethering on iPhone 3.1.2 Firmware. UPDATE 4: Native MMS functionality in Messages app on iPhone 2G can now be enabled using the step by step guide posted here. UPDATE 5: Fix Push Notifications on Hacktivated iPhone 2G/3G/3GS running iPhone firmware 3.1.2 can be found here. UPDATE 6: blackra1n RC2 is Live. Click here for more details. UPDATE 7: blackra1n RC3 with blacksn0w is now available. Follow the complete step-by-step guide here to jailbreak, and here to unlock iPhone 3.1.2 firmware with 05.11.07 baseband. i click the make it ra1n button, but nothing happens to my ipod. it just turns off. please help! when i turn it back on, the blackra1n app isnt on it!!! please help!!! ipod touch 32gb 3rd gen PLEASE HELP ME!!!!!!! thanks for the advice, but i tried that many times. do you know any other ways that helps? Put SIM card back in! 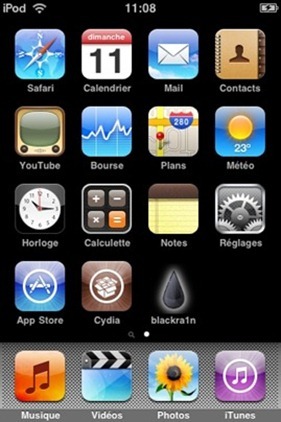 hi, can this jailbreak & unlock on Iphone 3g 3.1.2 on 05.12.01? ?